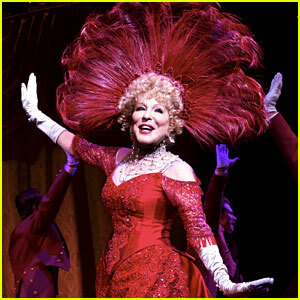 Bette Midler to Return to 'Hello, Dolly' on Broadway! 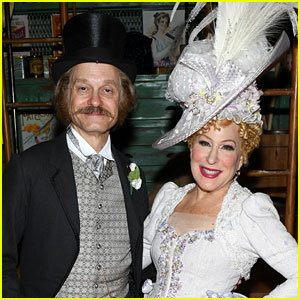 Bette Midler will return to the Broadway production of Hello, Dolly for a special six-week engagement this summer! 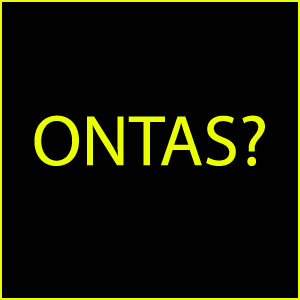 The legendary performer originated the role in the new revival and won the Tony Award for Best Actress last year. Bette will return alongside David Hyde Pierce and fellow Tony winner Gavin Creel from July 17 through August 25. The production will close following their final performance in the musical. Bernadette Peters succeeded Bette in the role and she will leave the production on July 15. Tickets for the final dates go on sale April 28. Bette Midler Joins 'Hello Dolly' Cast at Tony Awards 2017! The legendary actress was joined at the event by her daughter Sophie Von Haselberg, as well as her co-stars David Hyde Pierce, Gavin Creel, and Kate Baldwin. Bette, David, Gavin, and Kate are all nominated for their performances in Hello, Dolly, which is up for 10 awards including Best Revival of a Musical. David is expected to perform the song “Penny in My Pocket” during the show while Bette will hit the stage to present an award. FYI: Bette is wearing a Michael Kors Collection gown and clutch. Kate is wearing a Cristina Ottaviano gown. There’s a good chance that we won’t be seeing a performance from nominee Bette Midler at the 2017 Tony Awards next weekend. The legendary entertainer is nominated for Best Performance by a Leading Actress in a Musical for her work in Hello, Dolly, which is nominated for ten awards. While it was expected that Bette would perform the famous title number, it seems like it’s no longer likely. The producers of the musical reportedly want Bette and the cast to perform live from the Shubert Theatre, where the show is performed seven times a week, rather than at Radio City Music Hall, according to the New York Times. 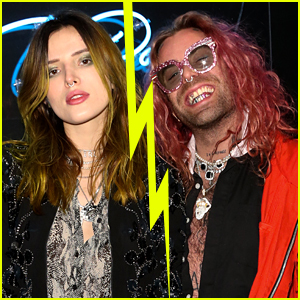 “We don’t discuss specifics about the musical performances in advance of the telecast. The show is still in the planning stage and subject to change,” a spokeswoman for the Tony Awards told the paper. The awards show has reportedly declined a remote performance and it’s likely that leading man David Hyde Pierce will perform a solo number instead. Bette will present an award if she does not perform. 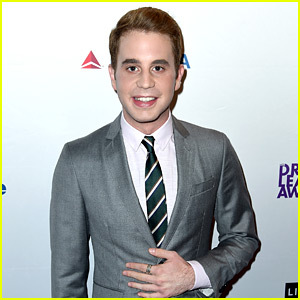 Ben Platt Wins Performance Prize at Drama League Awards, Breaks Record for Youngest Winner! Ben Platt walks the red carpet while attending the 2017 Drama League Awards Ceremony at the Marriott Marquis Times Square on Friday (May 19) in New York City. The 23-year-old actor beat out all of the other performers on Broadway this season to win the Distinguished Performance Award. Only one person wins the award each year and each recipient can only receive this award once during his or her career. Ben, who won for his work in Dear Evan Hansen, becomes the youngest winner of the award ever! 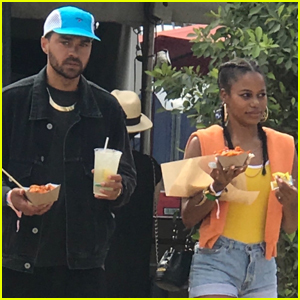 Other stars that were in attendance included Natasha, Pierre and the Great Comet of 1812‘s Josh Groban, Denee Benton, and Lucas Steele, Dear Evan Hansen‘s Rachel Bay Jones and Laura Dreyfuss, Six Degrees of Separation‘s Allison Janney and Corey Hawkins, Bandstand‘s Laura Osnes, Sunset Boulevard‘s Glenn Close and Michael Xavier, The Little Foxes‘ Laura Linney and Cynthia Nixon, Groundhog Day‘s Andy Karl, The Price‘s Danny DeVito, Falsettos‘ Andrew Rannells, Brandon Uranowitz, and Christian Borle, Significant Other‘s Gideon Glick, The Glass Menagerie‘s Sally Field, and Hello Dolly‘s David Hyde Pierce and Kate Baldwin. Sara Bareilles Feels Like A 'Very Lucky Girl' Thanks To Tony Awards 2016 Nomination! Sara Bareilles strikes a pose on the red carpet while attending the 2016 Family Equality Council’s Night At The Pier held on Monday (May 9) in New York City. The 36-year-old entertainer was joined at the event by hosts Gloria Estefan and Emilio Estefan, On Your Feet! stars Ana Villafane and Josh Segarra, David Hyde Pierce and Waitress star Jessie Mueller. Sara recently opened up about her Tony Awards 2016 Waitress nomination for Best Original Score (Music and/or Lyrics) Written for the Theatre. 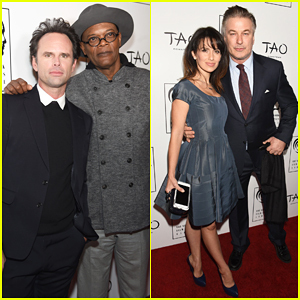 Samuel L. Jackson, Walton Goggins & More Hit NYC for Film Critics Circle Awards 2015! Samuel L. Jackson and Walton Goggins get together for a photograph on the red carpet while attending the 2015 New York Film Critics Circle Awards held at TAO Downtown on Monday (January 4) in New York City. The 67-year-old actor and his 44-year-old Hateful Eight co-star were joined by Michael Keaton, Alec Baldwin and his wife Hilaria, George Takei, Paul Haggis and David Hyde Pierce. Carol swept the ceremony with four awards, including Best Picture, Best Screenplay, Best Cinematographer for Edward Lachman, and Best Director for Todd Haynes.